Spraining my ankle last month has impacted me more than just physically. Not being able to exercise as I normally would has brought changes including not always feeling as mentally sharp, motivated or energized. With my activity curtailed, I also miss seeing the seasonal changes nature paints in September as I walk. It’s time to explore a different way. Physical exercise is one of the best things we can do for our bodies and our brains. The increased blood flow helps feed our brain cells and keep them growing and functioning well. Less exercise means less blood flow to help maintain our brains and bodies. But when injured or other life situations occur, we can’t always keep our exercise routine. It’s in these times we need to get creative. Exercise takes all forms. The important element of exercise that assists our brains is the aerobic component-creating enough exertion to increase oxygen flow to brain and body. This can be done in a myriad of ways. Just because our normal routine isn’t possible, doesn’t mean we can’t still be physically active. Use different methods. I typically take brisk walks to exercise. But lately I’ve been doing more stretching, isometrics and limited walking within what’s feasible. It’s not ideal but it’s something. Now that my ankle is more stable, I’m going to add biking and yoga to the mix. Doing different forms of exercise also strengthens different muscle groups and keeps our brains thinking! Take a class. Trying something new or being in a group not only helps us learn new activities, but helps maintain a pace and do so in a social environment-all incredibly brain boosting behaviors! Do it Together. When exercising alone, we can lose motivation. Exercising with a friend creates accountability and makes it more fun! Go Exploring. Different venues can create an atmosphere of adventure. I love seeing the colors change when I go for a walk. Exploring different local areas allows me to experience this in a new way while hiking or biking which is different for me. Great for brain and body! Physically exercising our bodies can become difficult at times due to injury, lack of motivation, boredom, or other reasons. Being creative and exploring new options or opportunities to exercise differently allows us to keep it interesting and fresh. This not only benefits our bodies but also our brains and memories in many ways. 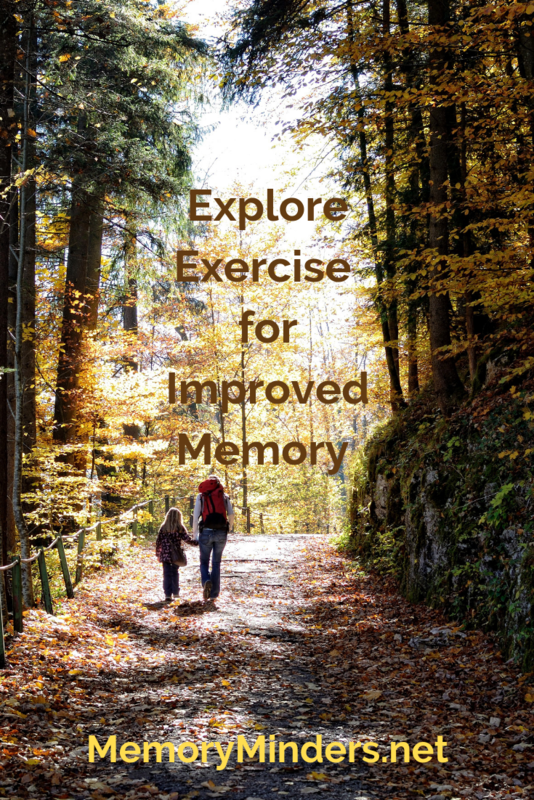 Exercise is an important element of our lifestyle which greatly affects our memories. Let’s not delay, defer or procrastinate, but instead go exploring! So encouraging, hope you’ll be up to a walk soon! Thank you again for another wonderful post!